Hera was the wife of Zues and the queen of all the Olympian deities. She is the most beautiful of the immortals, even more beautiful than Aphrodite. Hera was mainly worshipped as a goddess of marriage and birth. It is said that each year Hera's virginity returns by bathing in the well Canathus. 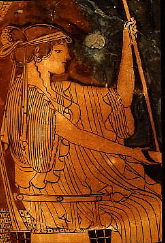 Writers represented Hera as constantly being jealous of Zeus's various amorous affairs. She punished her rivals and their children, among both goddesses and mortals, with implacable fury.